Enjoy your drive—no matter what Mother Nature has in store—with a set of Putco Element Tinted Window Visors. Designed to keep harsh elements from invading your interior, these must-have accessories are the perfect way to prevent sun, wind and rain from ruining your ride. 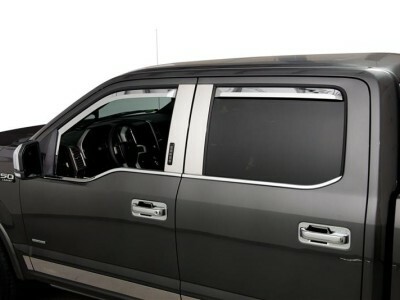 As fashionable as they are functional, Putco Tinted In channel Window Deflectors allow a steady stream of fresh air to flow in, while adding a sleek look to your vehicle’s exterior. 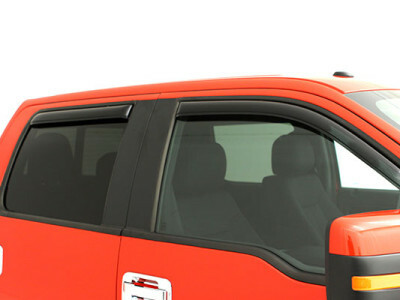 Constructed from durable GE polycarbonate, Putco Element Smoke Tape On Window Visors are made to stay dent-free for miles of rough roads ahead. 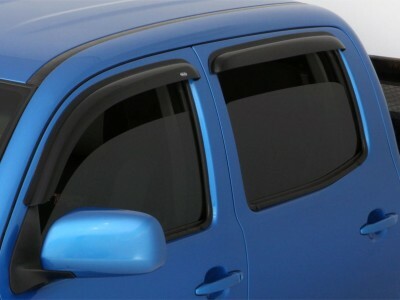 Putco Tinted In Channel Deflectors are injection-molded for a custom-fit on your specific car, truck, van or SUV and are available for in-channel or tape-on installation (depending on vehicle). 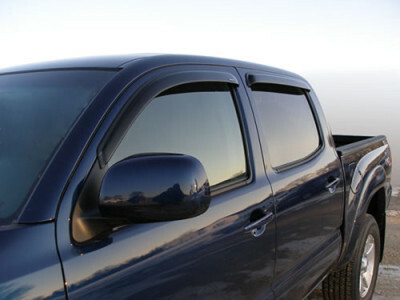 Your Putco Element Tinted Window Visors are backed by a 1-year warranty. 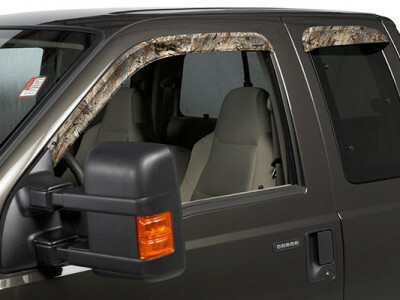 Keep your cockpit as quiet as a predator on the prowl with Stampede TAPE-ONZ Camo Side Window Deflectors. Whether you’re on the hunt or muscling through a muggy morning commute, a steady flow of fresh air is essential to an enjoyable ride. 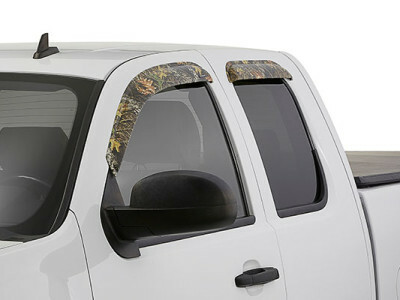 Stampede camo vent visors are specially designed to swirl stale air out and bar the bad stuff from getting in for an always-comfortable interior. 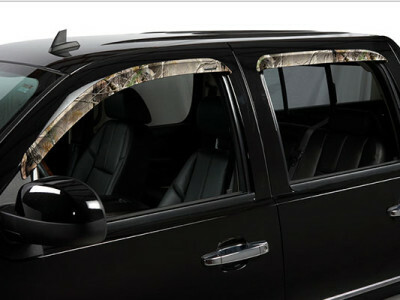 Stampede camo window deflectors are available in an amazing array of stealthy camo patterns. So, from stalking prey in the backcountry to laying low in the desert, there’s a Stampede style suited to your situation. 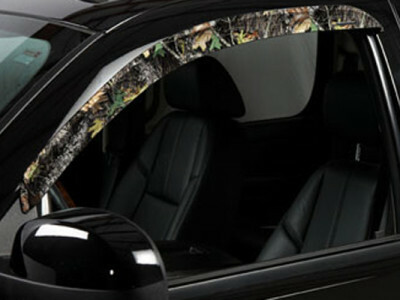 Custom cut to perfectly fit your specific vehicle, Stampede camo window deflectors fit flawlessly right out of the box. And, they install easily with 3M tape for bullet-fast installation. 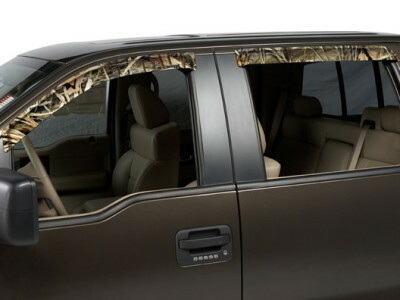 On top of that, they’re built-to-last from high-impact acrylic for years of camo-covered adventures. 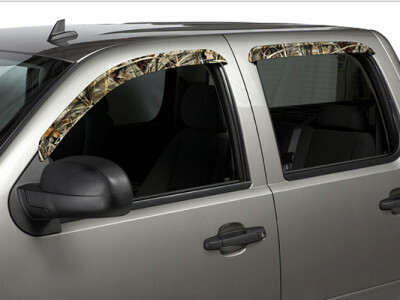 What’s more, your Stampede TAPE-ONZ Camo Side Window Deflectors are backed by a 1-Year Warranty. Rain, sleet, snow and wind gusts have nothing on your ride once it’s equipped with sleek, streamlined AVS In-Channel Ventvisors. These custom-made In-Channel Ventvisor lessen wind noise by channeling the airflow away from your vehicle, resulting in a more enjoyable journey … no matter what the weather’s like outside. 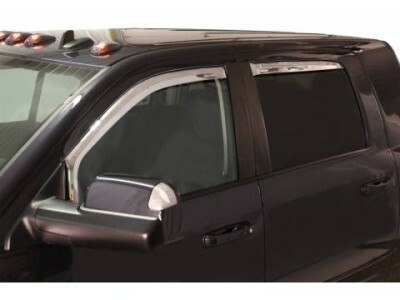 Durable AVS In-Channel Ventvisors help you let the fresh air into your ride while protecting vehicle’s interior from any harsh elements that may be taking place outside. 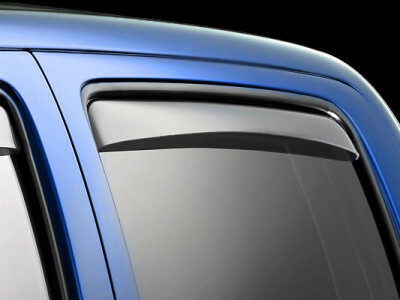 In-Channel Ventvisors from AVS are aerodynamically-designed to blend in beautifully with your vehicle’s contours. 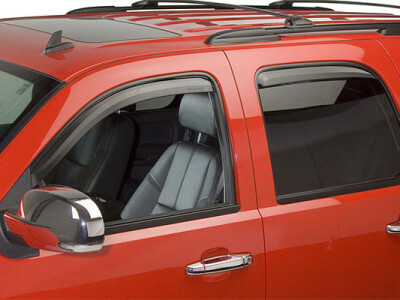 Each vent visor boasts construction from smoke-tinted, high-grade acrylic, ensuring years of dependable use. AVS In-Channel Ventvisors can be easily painted to match your vehicle’s finish and are precision-cut for an exact fit on more than 200 vehicle applications. AVS In-Channel Ventvisors guarantee easy installation, with no cutting or drilling required. 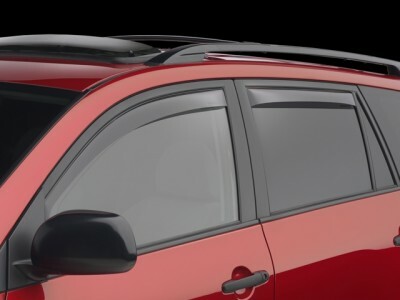 These vent visors secure into the window channel or along the rubber seal with pre-applied 3M automotive tape – absolutely no tape touches your vehicle’s finish. Drive in comfort while protecting your vehicle’s interior, and enjoy the Lifetime Warranty that comes with every AVS In-Channel Ventvisor. 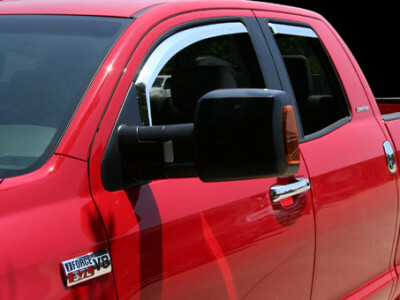 Give your stuffy cabin a breath of fresh air with the help of WeatherTech In-Channel Side Window Deflectors. 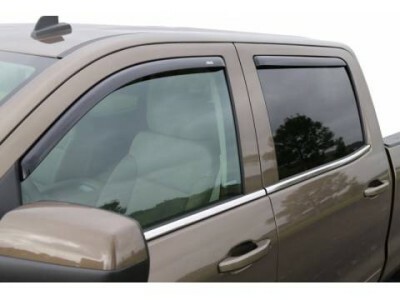 Custom-designed specifically for your vehicle, this WeatherTech vent visor installs within the window channel, allowing you to easily open your windows and let the fresh air flow through without experiencing ear-splitting wind noise. 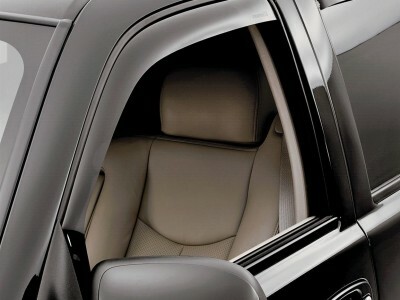 Even if it’s storming outside, you don’t have to worry about adverse weather wreaking havoc on your pristine interior. 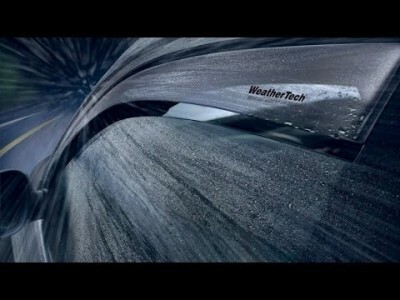 WeatherTech In-Channel Side Window Deflectors are precision crafted from high-impact 3mm acrylic, so they’re built tough to resist everything from scratching and UV radiation to airborne road rubble and other roadway hazards. These in-channel vent visors also give your ride a visual upgrade, thanks to their ultra-thin, aerodynamic design. 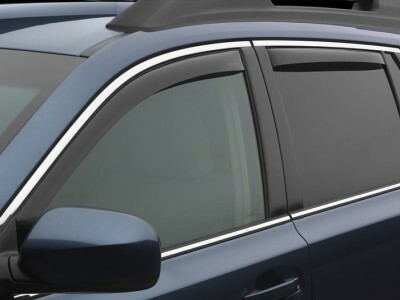 This sleek, low profile reduces wind noise when you drive and allows interior heat to escape when your vehicle’s parked outdoors. 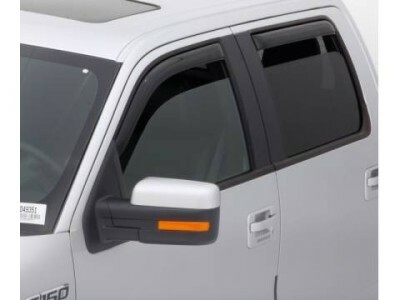 Installation is a cinch—no drilling or exterior tape required—and these window deflectors are available in light or dark tints (for most vehicles). 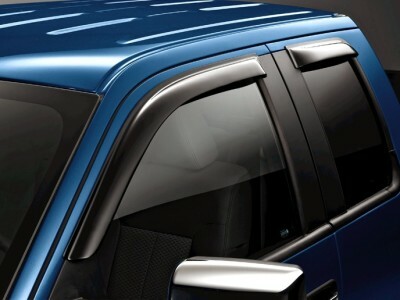 Keep your interior fresh and your passengers comfortable by installing WeatherTech In-ChannelSide Window Deflectors, and enjoy a 3-year warranty against defects in material and workmanship.